Grueter CC, Matsuda I, Zhang P, Zinner D (2012) Multilevel societies in primates and other mammals: Introduction to the special issue. International Journal of Primatology 33:993-1001. Murdoch (1981) remarked that nowhere on Earth do people live regularly in isolated families. The habitual formation of superfamily level groupings is one of the unmistakable universals of human sociality. Males and females within these higher level groupings are connected via kinship and affinity ties, and affiliative and cooperative bonds reach far beyond the nuclear family unit (Rodseth et al. 1991; Wiessner 1977). Although interunit encounters are usually circumvented or characterized by animosity because of mating or resource competition in many nonhuman primates (Cheney 1987; Fashing 2001), some primates such as hamadryas baboons (Papio hamadryas), geladas (Theropithecus gelada), snub-nosed monkeys (Rhinopithecus spp. ), and proboscis monkeys (Nasalis larvatus) (for an exhaustive list, see Grueter et al. 2012) exhibit a social arrangement in which regular or constant proximity as well as coordinated activity among subunits is the norm. This type of social organization has been termed multilevel, nested, or modular. The phenomenon of social modularity is not restricted to the primate order. Similarly structured societies can be observed in other mammals, most notably African elephants (Loxodonta africana: de Silva and Wittemyer 2012; Moss and Poole 1983; Wittemyer et al. 2005), Asian elephants (Elephas maximus: de Silva and Wittemyer 2012), plains zebras (Equus burchelli: Rubenstein and Hack 2004), khulans (Equus hemionus: Feh et al. 2001), prairie dogs (Cynomys ludovicianus: Hoogland 1995), sperm whales (Physeter macrocephalus: Whitehead et al. 1991, 2012), and killer whales (Orcinus orca: Baird 2000). It is obvious that our knowledge of these intriguing societies is still limited. Unfortunately, most species showing multilevel sociality are endangered, and pristine conditions allowing the complexities of multilevel systems to unfold unhampered are becoming rare. Bands of snub-nosed monkeys often occur in fragmented habitats with limited or absent connectivity with neighboring bands (Grueter et al. in press). Bands/populations of proboscis monkeys have become locally extinct as a result of habitat loss (Sha et al. 2008). Heavy modern whaling in the Pacific may have destroyed the integrity of many sperm whale social units (Whitehead et al. 2012). Poaching has altered the expression of the elephant social system (Foley 2002). 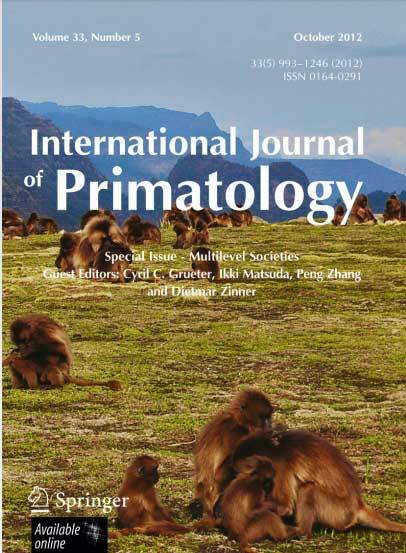 We hope that this special issue will spark interest among primatologists, mammalogists and biocultural anthropologists to embark on studies pertaining to the structure and evolution of these multilayered societies and thereby not only contribute to a better understanding of the evolutionary drivers of human social evolution, but also raise awareness for the plight of this unique evolutionary heritage. See more detailed introduction below paper, Grueter CC, Matsuda I, Zhang P, Zinner D (2012) Multilevel societies in primates and other mammals: Introduction to the special issue. International Journal of Primatology 33:993-1001.